It’s November and Christmas is just around the corner. There are opportunities to give Christmas gifts to needy Haitians again this year. If you would like to give, there are instructions below. As many of you know, we are in the process of building a medical clinic in Tricotte that will serve the entire area. The main building materials for the clinic are cinder blocks, and we need a lot more of them before we’re done. For $1.00 you can purchase, transport, and install one cinder block and contribute to the gift of medical care for many Haitians for years to come. When school started in October, several of our schools had more children enroll than we anticipated, and we didn’t have enough benches to accommodate them all. For $20 you can build a bench which will hold, depending on the age of the children, four to six students. It provides a place for them to sit as well as a surface for their books and papers. Of course, we still have goats and chickens, well-drilling, bibles, songbooks, and more, too. If you are interested in giving in this way, you can download a pdf file of the full Christmas list. 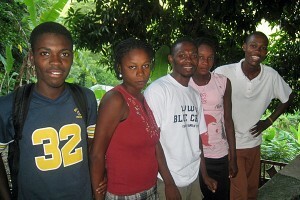 Edner (center) and four of the older orphanage children. In Haiti, every student must pass a standardized national test each year in order to move on the next grade level. The results of last year’s test were released recently, and every child in our orphanage passed the test. This is unheard of in Haiti where it’s not unusual for some students to remain at one grade level for several years before passing the test. In our orphanage, we’ve never been close to 100%. So what was the difference this year? In 2009, Edner Destima became the new Administrator/House Father of the Starfish Ministries orphanage. He has been wonderful for the children, and their newfound academic success is just example of the impact he has made. Sheryl and I are happy grandparents of our 8th grandchild. We praise God a healthy, beautiful baby girl! We are praising the Lord for the gift of twins, born to daughter, Karla, and husband, Andrew. Alyssa Ann and Luke Andrew were born March 19 and join Katelyn, age 3. They live in Lynden and Grampa and Gramma are enjoying them immensely!